The next installment of the popular series of Japanese RPG games combining the worlds of Square Enix production with characters and landscapes from Disney animated films. 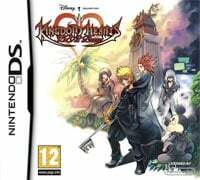 Kingdom Hearts: 358/2 Days is the work of Square Enix for the Nintendo DS portable console. It is also the first installment of the popular action RPG series, which came to this platform. So far, the previous parts have been released only on PlayStation 2, PSP and Game Boy Advance. In the game we get the opportunity to get to know the events taking place before Kingdom Hearts 2. Kingdom Hearts story: 358/2 Days takes place at a time when Sora, the hero of Kingdom Hearts, falls asleep to help him regain his lost memories (the two continue this fight). Here we play the role of Roxas, the so-called Nobody, who is a member of Organization XIII. Together with other members of the organization, we travel through Disney's land and try to discover and understand the links between Roxas and Sora, as well as the official reasons for the departure of the mysterious 14th member of the organization XIII. In the game come back heroes known from the previous scenes of the cycle - including Riku, and King Mickey. The production was created in full three-dimensional. The graphic design, as with the capabilities of Nintendo DS, looks exceptionally good. The authors managed to transfer to the game most of the elements known from the first and second parts, published on PlayStation 2. The game consists in exploring fairy-tale areas, conducting dramatic conversations with other characters, as well as participating in skill battles, constituting a mix of actions, jRPG and cards (thanks to the cards we select special attacks, among others). The production also includes a multiplayer mode for up to four people (WiFi). Especially for this option, the authors will develop a number of additional missions, in which we will play not only the members of Organization XIII, but also Xion, Donald and Goofy. Game score 8.2 / 10 calculated out of 44 players' votes. Expectations before the premiere: 7.6 / 10 calculated out of 15 players' votes.